Whether you have a couple of baby rabbits or you have a larger rabbit that needs a little extra running space then our 4ft rabbit hutches are for you. We understand that when you’re looking for the right rabbit hutch, you want to make sure that it is the perfect fit for all of your rabbits as well as being convenient for your garden. That is why our 4ft rabbit hutches come in a variety of sizes and shapes with plenty of accessories and covers to choose from so you can find the right product for your rabbit and your garden. 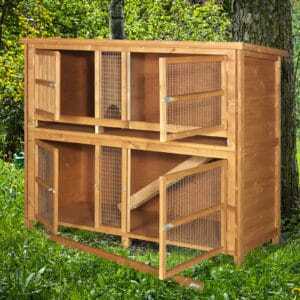 Our 4ft rabbit hutches are the tallest and the deepest on the market. Giving your pets more headroom and floor space while still in a compact footprint. 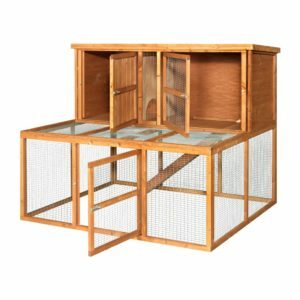 Some of our rabbit hutches come with two floors and ramps and others are standard 4ft length enclosures so you know that you will always be able to find something that meets your requirements when you choose Home & Roost as your online shop. 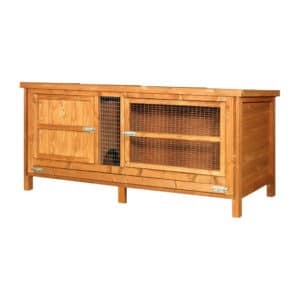 If you have multiple rabbits then our 2 tier 4 foot hutch is perfect. 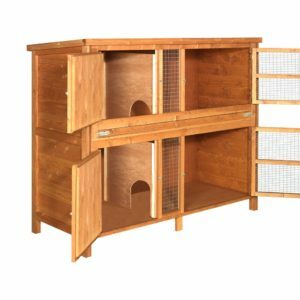 It has two separate areas, one above the other, so you can give your rabbits their own space while still only having one hutch. Each enclosure has two compartments, one is a private compartment that your bunny can hide in. 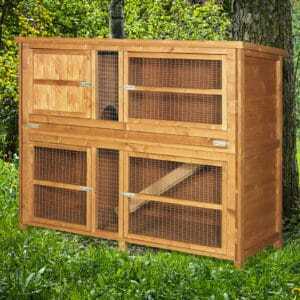 The other has a screen at the front to allow your rabbit to look around and get plenty of fresh air. 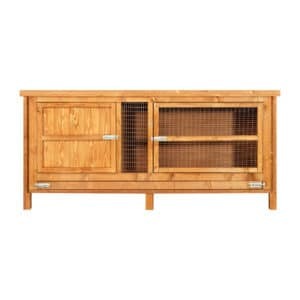 If you have one large rabbit or some babies, our double luxury hutch is perfect. This 4 foot hutch has two levels with a ramp connecting them. A sleeping area in the upper level is fully enclosed to offer your bunny some privacy and the rest has a wire screen cover, providing your rabbit with lots of room in their hutch to play and relax. If you need a rabbit hutch that can fit under a window or you have other height restrictions, our single level 4 foot rabbit hutches are ideal. They provide plenty of space while remaining inconspicuous. This hutch is also perfect for anyone with a small garden. For families who have more space, you can give your rabbit the ultimate luxury home with our 4 foot hutch and run combo. 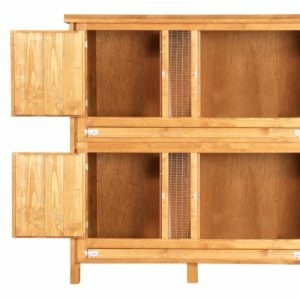 This provides a hutch with a run underneath connected by a ramp, giving your rabbit a place to exercise and play with a secure home attached. 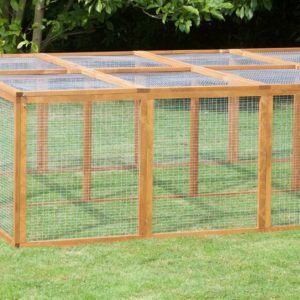 All of our 4ft rabbit hutches are made out of durable wood and come with rugged caging wire as well so you know that you will get a quality product that will last and last. If you want to give your cage a little added protection or if you want to get a cover for your cage to keep your pet warm in the winter, why not take a look at our hutch huggers today. They fit a wide range of our 4ft hutches and they are great for keeping the wind and rain out as well. If you’re not sure what size you need then you can view all rabbit hutches here or if you’re not quite sure what hutch your rabbit needs or are looking something a little different to what we have in store, contact us and we’ll do everything we can to help you find the product you need.